Initially a Norfolk club, over the years members have joined from an increasingly wider area which now includes Suffolk, Essex & Cambridgeshire and beyond, making us now a regional club. 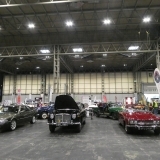 To encourage use of the cars, and to offer a pleasant day out, events/rallies are attended or organised in all these areas throughout the summer. We are a dynamic and expanding club, with a wide range of activities, and membership is open to Rover owners or those just interested in the marque. New members are always welcome and details together with an application form can be found on the membership page. Members have access to a list of other rallies together with contact details for the club partners, for body/upholstery/paint workshops/parts suppliers, etc., locally and with a members newsletter 3 times a year. The meetings give members the chance for a friendly chat with other enthusiasts or just a social get together. In addition the club organises trips out through the season, including a ladies day out towards the end of the year and an annual Christmas lunch. The club holds its now Nationally recognised Annual |Rally at the beautiful Bressingham Gardens and Steam Museum near Diss, Norfolk on the late May Bank Holiday Sunday. This event has now been running over many years and often attracts well over 100 cars with each model being well represented. Trophies are awarded for the best cars as judged by those attending and the car of the show is chosen by the Rally Sponsor. The rally is open to non members and details are available from our Events Page where you can download a printable entry form.